Following its official founding on June 5, 1860, Augustana quickly, and rightfully, earned its nickname given by historians. Less than a decade after “the College on Wheels” settled into its first home in the basement of Chicago’s Norwegian Lutheran Church, Augustana would move to Paxton, Illinois, in 1863, then to Marshall, Wisconsin, in 1869. Shortly after Augustana arrived in Marshall, Endre Endresen Eidsvaag, a local farmer, quietly donated a 1,500-pound brass bell originally poured by the Niles Bell Foundry in Cincinnati, Ohio, to the school. An immigrant from Norway, Eidsvaag arrived in the U.S. in 1851 and settled in Deerfield, Wisconsin, a small community close to Marshall. His son, John Anderson Boe, was a local merchant, and his grandson, L.W. Boe, would eventually be named president of St. Olaf College. Little else is known about Eidsvaag, including why he chose to donate the Bell. Other than his obvious connection to the Lutheran Church, perhaps he was inspired by the tenacious spirit of the school’s founders; or, maybe he believed in the mission of educating teachers and pastors. At any rate, school officials graciously accepted Eidsvaag’s gift, hoisted the Bell, attached a rope and rang it often, proudly. By the late 1870s, Augustana’s leaders found themselves lured by the western frontier. Thanks to strong encouragement from Norwegian James Wahl, commissioner of Immigration for the Dakotas, the school’s leaders made the decision to move to Beloit, Iowa. In 1881, school officials began making arrangements to move the Eidsvaag Bell, along with the other contents from the building. Wahl was also given authority by the Church to move the school and all its belongings from Marshall to Beloit. The people of Marshall, however, had other plans. 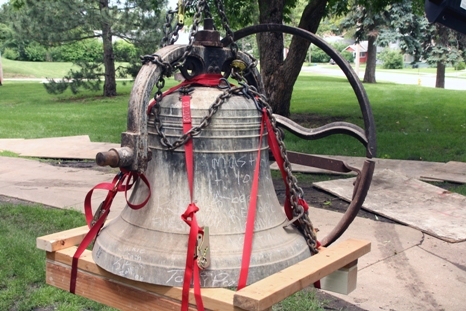 They believed Augustana’s possessions, including the Bell, belonged to the building — not the school. Led by William Porter, an influential local millionaire, local residents and merchants refused to help Wahl move any of the building’s contents. Wahl was forced to buy ropes, pulleys and supplies in nearby Madison to execute the move westward. When the Bell was removed from the bell tower and lowered to the ground, some 30 agitated men showed up to voice their disappointment. They threatened to take the Bell and throw it in a nearby millpond. Wahl and Professor Lysnes were able to calm the crowd and it gradually dispersed. Eventually, students and railroad authorities helped Wahl move the school’s possessions to the railroad station. When the Bell was taken to the railroad station the next day, the local sheriff served school officials with legal replevin papers. A 24-month-long court battle followed. Eventually, both parties agreed to an out-of-court settlement and the Bell was allowed to travel to Beloit in September 1883. Porter paid all court costs and shipping fees to Beloit. 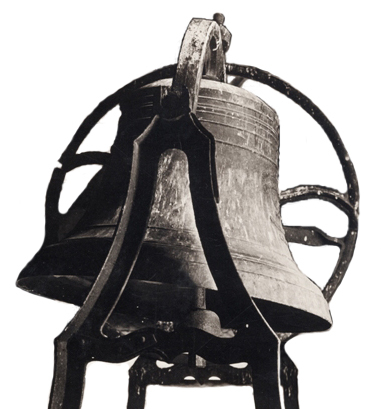 After Beloit, the Bell followed Augustana to Canton, Dakota Territory, in 1884 and finally, to Sioux Falls, where it was installed in the bell tower of Old Main in 1918. For more than 60 years, the signature sound of the Eidsvaag Bell signaled the beginning and end of classes and commemorated major events on campus, such as opening day and graduation. However, after the weathered and aging Old Main was officially retired from classroom use in the 1980s, the Bell was no longer rung. In honor of Augustana’s Sesquicentennial, College officials extracted the Eidsvaag Bell from Old Main on June 21, 2010. For the first time in 92 years, the Bell saw the light of day. The Bell was re-introduced to students, faculty, staff and alumni at the Opening Convocation ceremony on Sept. 8, 2010, where the poem, Restoring the Eidsvaag Bell, by Dr. Patrick Hicks, Associate Professor of English and Writer-in-Residence, was read. Initial plans call for the bell to be rung at football games, Homecoming and at other important college events throughout the 2010-11 academic year before a permanent home on campus is identified.